The Flashcards content type is a set of cards containing a picture on one side of the card and a corresponding text on the other side. The learner is asked to type a word or expression corresponding to the picutre, before turning the card and revealing the correct answer. Flashcards can be used as a drill to help learners memorize words, expressions or sentences. Typical Flashcards provide a prompt on one side of the card, and an answer on the other side. In H5P Flashcards, pictures are used as the prompt. If you are looking for Flashcards with text prompts, take a look at the Dialog cards content type. Flashcards are often used in language learning for drilling words and expressions. Flashcards can also be used to present math problems or help learners remembering facts such as historical dates, formulas or names. Navigate to the menu that enables you to create new content. In Drupal, you select Interactive content. In WordPress you press Add new under H5P Content in the admin menu. If you find Flashcards in the list of Content types, skip to Step 1. You will now find Flashcards in the Content type list when creating a new H5P. Flashcards are often used in language learning. In this tutorial, the topic will be Spanish berry names. We'll create a set of Flashcards with pictures of various berries. The learner is asked to type the correct berry name in Spanish. We will use pictures of strawberries, blackberries and raspberries. Head over to where you usually create new content on your platform. In Drupal you go to Create content and select Interactive content. In WordPress you select H5P Content and Add new from the admin menu. Then select the Create option for H5P and choose Flashcards from the list of Content types. In this tutorial, we'll focus on creating the Flashcards content. 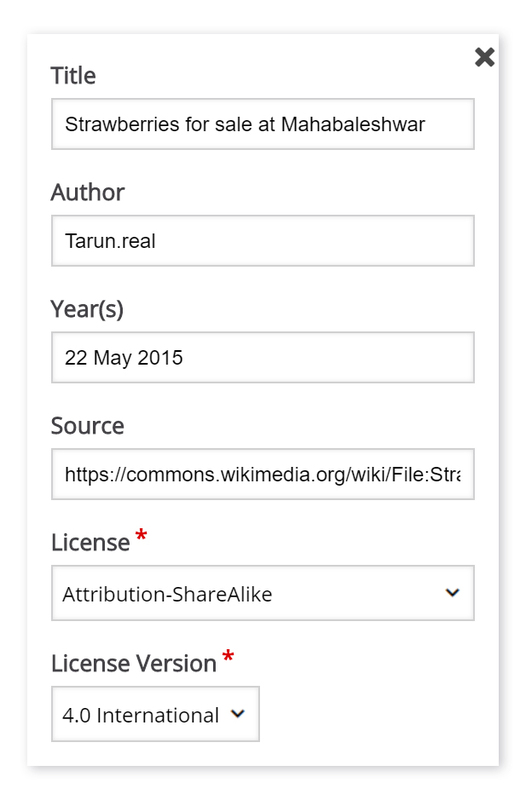 We'll, therefore, focus on the parts of the editor above the Common fields header. 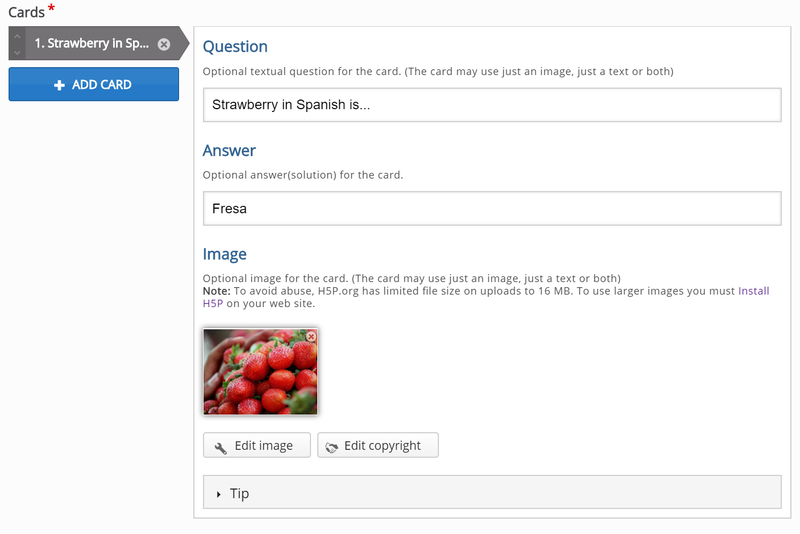 The Flashcards content type consists of a Task description and a set of Cards. 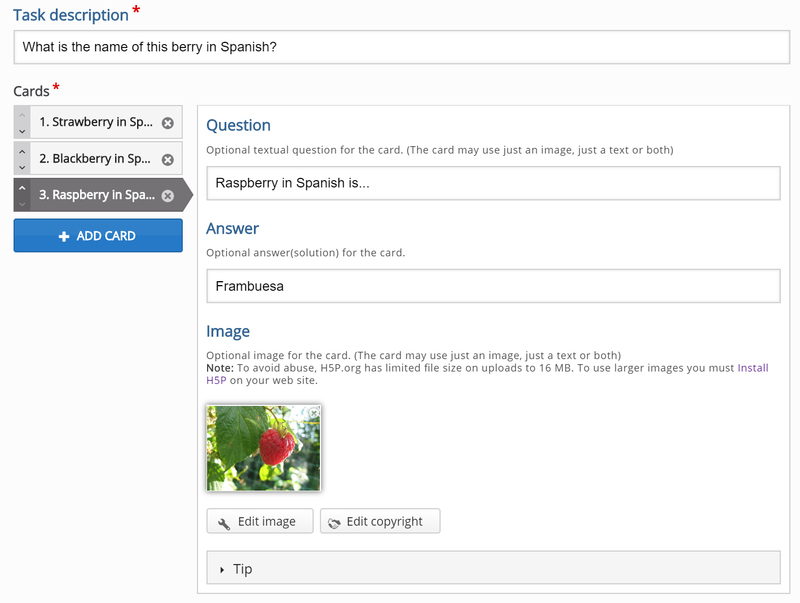 On this first card, we'll present the learner with a picture of a Strawberry and ask the learner to type the Spanish name for Strawberry. 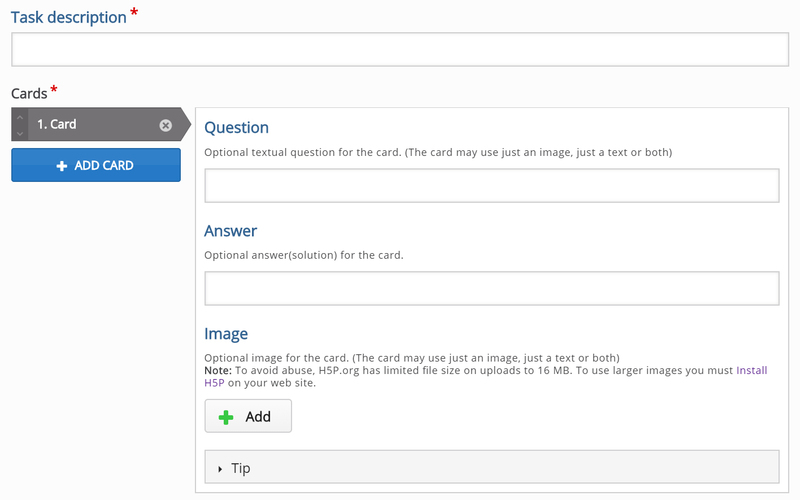 The Question text can be customized individually for each card. We'll use the Question field to give the learner instructions on how to solve the problem. You can alternatively use this field as a textual prompt or to give the learner an extra hint. The Question text is optional. What is the Spanish name for the berry in the picture? Under Image, we add an image of a Strawberry. 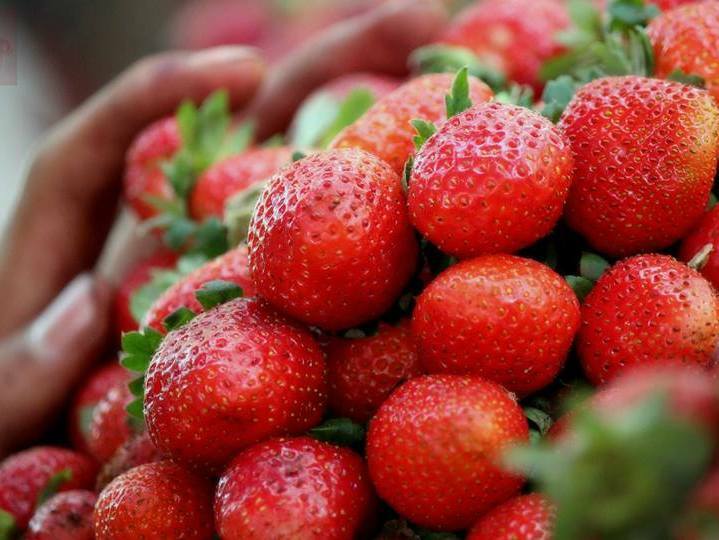 Since we want the user to type in the singular form of the noun Strawberry, we make sure to find a picture which only shows one Strawberry. This picture by Tarun.real was found on Wikimedia Commons and is licensed with the Creative Commons Attribution-Share Alike 4.0 Generic license. Download the picture from Wikimedia Commons in an appropriate size. Press the "+Add' button to browse for the image you just downloaded. After you have selected the picture, it will be uploaded and a thumbnail of the picture will be displayed. We'll add three more cards in a similar way and use the same Task description text for all the cards. You can add as many cards as you want. Press the Add card button to add the new Flashcard. You remove cards by pressing the "X" button in the top right corner of the Card. You change the order of the cards by clickin on the up and down arrows in the tabbed list of cards to the left of the Card editor. Below is a list of links for the remaining three pictures we'll use in this tutorial. Pictures must be downloaded from an appropriate source, and then uploaded to the editor. Save the node/article when you're satisfied to view your final set of Flashcards. when I use an apostrophe in the answer, it doesn't recognize the answer. Any ideas how one might be able to fix this? thanks a million. Hi, I am still having problems with any kind of apostrophe in the answers. This is kind of a necessity for me. So I like to know if I am the only one with this problem and if not any idea where I can look to sort this problem out. Apostrophe problem still exists in current version 1.3 of Flashcards. Hi, I found the bug. It had to do with a 'double cleaning of inputs'. Here's a link to my fix on github. You can either pull down the changes now or wait until the next release, it should be included there. Thank you. I sent you a link via contact form. Очень понравилось состовлять флешкарточки. Интересно и не сложно. Would it be possible to expand the supported image types to include "jpeg"? Otherwise, I need to change the extension on any .jpeg to .jpg. This is fine for me but if I were to present this tool to faculty who are not as experienced about file formats, this could be a frustrating problem. There is a fix in the pipeline for this. So it sould be resolved in the next release. but that link is dead! Thanks for letting us know. We will fix that soon! Admittedly I've been running the wordpress/anki circuit for a good 10k + hours - but I just installed this plugin and created my first 20 card deck in 20 minutes with a minimum of fuss. This is so great! Of course I have a couple of wishlist items, why not? 1. How difficult would it be to have the check button turn into a next button after I pressed the enter key once - so that I could move to the next card by pressing the enter key a second time? 2. How difficult would it be to put the cards I got wrong back into the deck and then run them by me again until I've either gotten everything right or decided to take a break? There is concrete ongoing work to improve keyboard support for all the content types. Maybe not exactly what you asked for, but still, you get an easy way to navigate trough the content. Great idea! If you put it on the feature request part of the forum, it has a greater chance to be picked up by the community or core team. Is it possible to mix the cards? I mean - different mix for every user who play with flashcards. Hopefully, a developer from the community will pick it up. Is it possible to show a results for user after check of all cards? Is there any way to add audio to a flash card? This would be ideal for a spelling exercise. Hi, this is not currently possible. Currently it doesn't have that option. I suggest that you head over to the Feature request page and post your suggestion/request there. I am new here so I am sorry if this has already been asked and answered. I have read many of the previous comments already. I have to make a lot of flashcards for many lessons and I was wondering if I can just import tab delimited text to get the ball rolling. Let’s say I have 25 words for a certain lesson. I have all those words in a spreadsheet already. Inputting them one by one on H5p seems so inefficient. I'm sorry but currently this is not possible. I think this will be a great addition to this content. I suggest that you head over to the Feature Request forum for a better chance of this getting implemented. I created, with flashcards, a content for Moodle, but the content looks very big, how can I change the size? I am new here so I am sorry if this has already been asked and answered. I apologize for my English. Is there currently a way to allow the cards to account for answer variation? For example, if I want them to identify a line graph, it would be great if both "line" and "line graph" (and possibly "a line graph") were all correct. You are right that this feature is needed in this content and thank you for adding your input in the feature request for this. Where are you creating your contents? If you are creating your contents in one of the supported plugins and you can use a PHP hook, to add your own CSS-file to the content type. Please visit the Visual Changes page for more details. The higher the resolution the better. If you use an image with the size of a thumbnail for example it will be stretched and will become pixelated. Also since the space provided for the image is square, having a square image looks best since there wouldn't be much space around the image. I preapared a sample content that better illustrates this. Please note that the image's base size is 256x256 pixels. In this game, how could you track the individual scoring for example has input name and timer system on it prior playing the game. Your help is very much appreciated... Thank you! I'm afraid tracking the time is not possible. Although for the score H5P emits data in the form of xAPI statements and you will need a plugin or custom code to listen to these statements and a data store such as a learning record store to save them in. Hi guys! I just testing and using this content type for a intern marketing action, but the users are suppose not allowed to try more than one time (because their valid results should be the first one, only). With this scenario, i not found the option of disable the Retry button. There's another way to do this? Because other content types usually have this possibility. Is there a way to allow students (using moodle) the ability to edit / create flashcards? Afaik this is not possible not unless you give them some editing capability, which means they can edit any content. I may be asking this in the wrong place, but currently working with flash cards and trying to output a user report similar to that seen on a drag and drop in h5p.com. Is this possible - either just a score to lms or full report of right or wrong in h5p? I realise not all content will have the same reporting functions but wondered if I was missing something? Flash Cards do not report results right now, but we already have a ticket for this issue scheduled for our next release. You can track progress in our ticket system. but what is idea size? The embed code is designed to be dynamic and should adjust to different screen sizes.